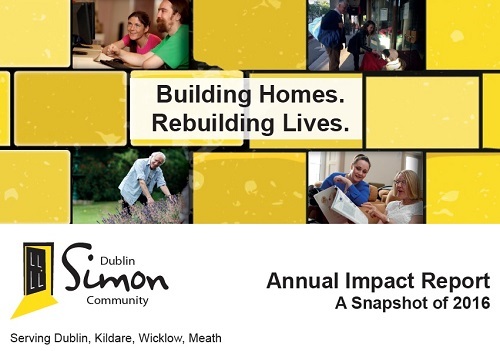 Dublin Simon Community provided services to 5,100 people and families across Dublin, Wicklow, Kildare and Meath throughout 2016, a 32% increase in caseload in the last year. 836 People accessed our emergency accommodation with care plans focusing on health, life skills and education, 21% increase since 2015. 19,200 Contacts were made by our outreach team and soup run offering vital support to people sleeping rough. 1,588 People were provided with housing assistance, harm reduction and medical services by our Rough Sleeper Team. 968 GP consultations took place at the Mobile Health Unit, in partnership with Safetynet. 40% Increase in our accommodation units during the year. 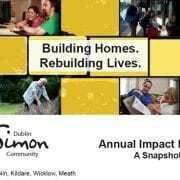 312 Adults and Children were in permanent homes provided by Dublin Simon Community by the end of 2016. 250,000 Meals were provided across our residential services with our kitchens providing nourishing food to improve wellbeing. 1,127 Households were supported to prevent them from homelessness through our sustainment and resettlement services across Dublin, Kildare, Wicklow and Meath, 27% increase since 2015. 1,185 Children were supported through our homelessness prevention and resettlement services. 1,023 People accessed our Medical Residential Treatment, Recovery and Counselling services, a 46% increase since 2015. 2,135 Hours of 1:1 counselling and mental health support were received by clients accessing Sure Steps Counselling, a 25% increase since 2015. 254 People expanded and developed their skills and education, with 40 people coming through our employability initiatives.